I had no idea there had been such a thing as Hip-Pocket Records until I stumbled across this "gem" late last year. 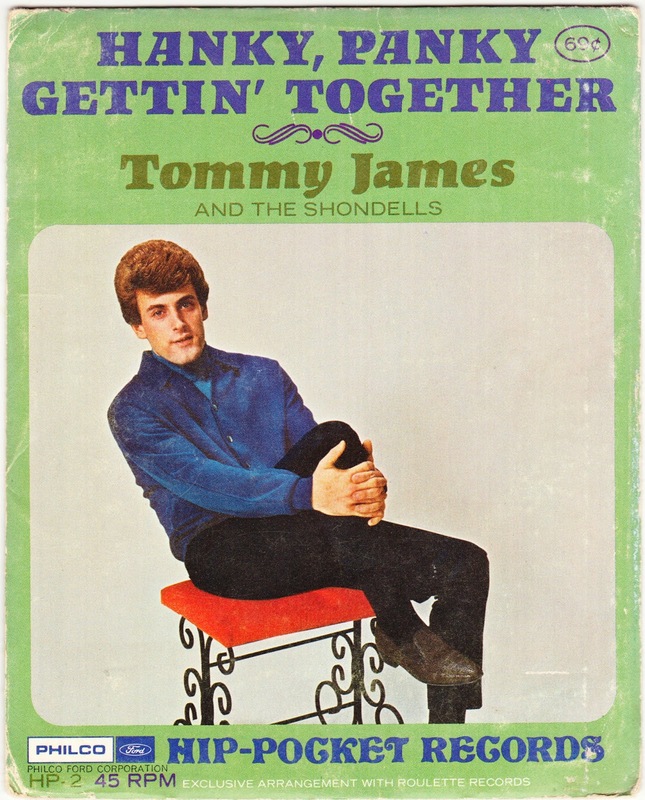 It's a five-inch wide envelope that holds a four-inch wide flexible record that features two singles from Tommy James and the Shondells — "Hanky Panky" and "Gettin' Together." The record, as you can see, isn't even as wide as a trade paperback. And so, as the name Hip-Pocket Records states, they could fit in your pocket. Portable music. That was the theory, anyway. Here's one of the less-than-subtle advertising images. The flexi-records were manufactured from 1967 to 1969 by Philco-Ford. (Ford Motor Company owned Philco from 1961 until 1974, when Ford flipped Philco to GTE.) According to the Museum of Obsolete Media, "Philco teamed with three major record companies, Atlantic, Mercury and Roulette, to produce music for them, and around 50 titles were released. They were sold for 69 cents at Woolworth, and also at local Ford Dealers and came in colourful packaging." 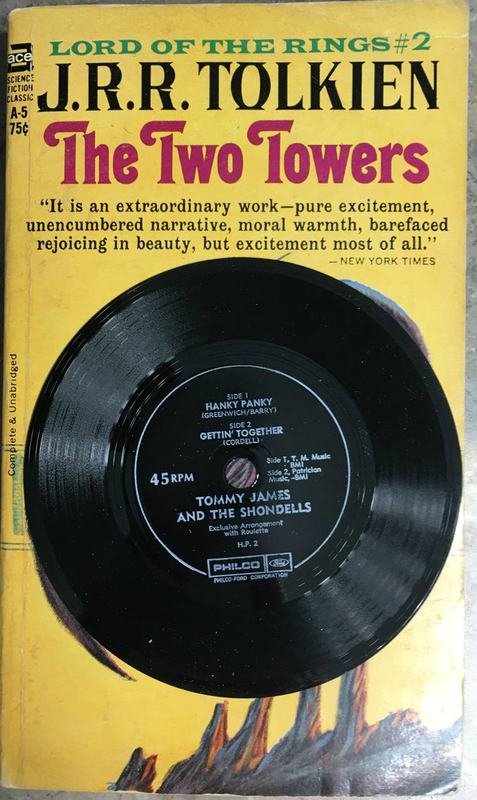 Vinyl Factory, which has a dandy gallery of Hip-Pocket Record covers, explains the quick downfall of the format: "They were marketed as more durable than regular 45s, but unsurprisingly this was not the case, with a typical Pocket Record deteriorating in quality after a dozen or so plays." 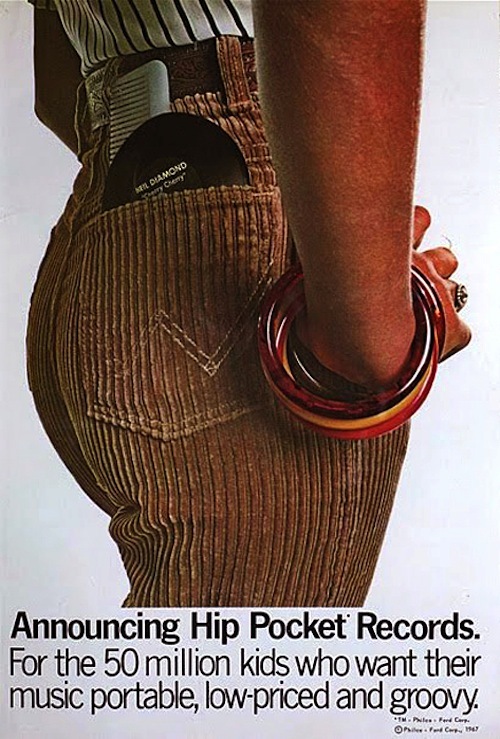 "The Americom Company sensed that Hip Pocket Records would be a long-lived fad, and produced their own form of Hip Pocket Records called Pocket Discs. These Pocket Discs were sold only in vending machines, and cost 50 cents. Americom teamed with Apple Records, the record company that backed the most popular band of the 60’s — The Beatles. Americom released Pocket Discs with Beatles songs as well as songs from other artists under the Apple label such as the Iveys and Billy Preston." And thus it was that Hip-Pocket records, despite coming first, faded into obscurity and are not even the best-remembered or most-collectible records in their format. The PocketDiscs didn't last long on the market, either, but they are highly sought, especially the releases featuring The Beatles. The NYU site adds this: "There is very little scholarly research on Hip Pocket Records. Most of the information on Hip Pockets comes from the memories of those who used them, posted on personal blogs. People remember receiving Hip Pocket samples in the mail. For many, Hip Pockets are a product of their childhood that died before its time." And, in fact, some of those blogs and websites cited are already gone, Lost Corners of the Internet that are truly lost.